A new store for shoe brand Camper designed by Tokujin Yoshioka will open in Regent Street, London later this month. 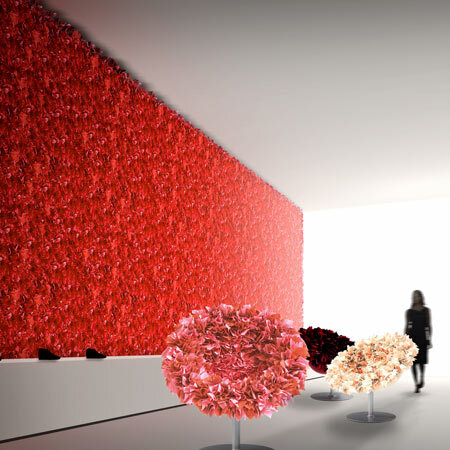 The store will feature a wall covered in folded artificial red suede, a development of an installation Yoshioka created for Italian funiture brand Moroso in New York in 2007, which used folded tissue. The chairs shown here, which also use the tissue technique, are Yoshioka's Bouquet chair for Moroso. See all our stories about Tokujin Yoshioka in our special category. Elements existing in nature such as plants and flowers always please us with their ever-changing expression. The idea for this new store, which incorporates such beautiful and miraculous principles of nature, is derived from the installation presented in New York in 2007, where approximately 30,000 sheets of tissues were covered in the entire space and created the reminiscent of snowscape. On designing the new store concept for Camper, the Spanish leading shoe brand, I pondered on creating a new value by embracing Camper's brand identity and the originality of my design as Camper has collaborated a number of projects with distinctive international creators until now. The red flower blossoms with an emphasis on the corporate color are in full bloom in the store. The store shares the similar world-view of the Bouquet Chair and brings elation to the viewers. It expresses the nature of tissue installation on more permanent basis.